Chickenpox was once a common childhood disease but since the vaccine was introduced in 1995, the number of cases has decreased dramatically. Given that only children over the age of one receive the vaccine, infants are still at risk for acquiring this highly contagious disease. Chickenpox is caused by the varicella-zoster virus. It is easily spread from person to person and causes itching and a blistering rash. The virus is passed along through direct contact or by breathing virus particles in the chickenpox blister. Someone with the virus can spread the disease as early as one to two days before the rash appears or as late as five to seven days after all the blisters have formed scabs. Most healthy full-term babies are usually protected against the virus at birth and during their first year of life because the antibodies against the virus are passed on in the womb. However, mothers who get the chickenpox during their last three weeks of pregnancy can pass it on to their newborn child. If you develop the disease five days before, or two days after delivery, your baby is likely to have a severe case. If your baby gets the disease five days after birth, most the time their symptoms will be mild. In 23 percent of cases where babies got chickenpox between five days and 12 days of age, the babies died. The rash is usually the first sign of disease in children. It will start out as small groups of itchy, red blisters. New blisters develop all over the body about four to five days after the first sign of the rash. The rash tends to form on the face, chest and back, or limbs. During the second phase of the disease, the rash will develop into a fluid-filled blister that may break open and reform. Finally, during the last phase, the blisters will turn into sores and eventually develop a crust and turn into scabs. Your baby may experience bumps, blisters, and scabs all at the same time. It usually takes one to two weeks for the scabs to fall off and your baby may be left with marks on the body that will fade over time. UptoDate, a clinical decision tool notes that complications from chickenpox are rare in healthy children but occasionally there can be inflammation on part of the brain responsible for balance which results in unsteadiness. Children with chickenpox may also experience pneumonia or the blisters can get infected with bacteria which can lead to lifelong scars. 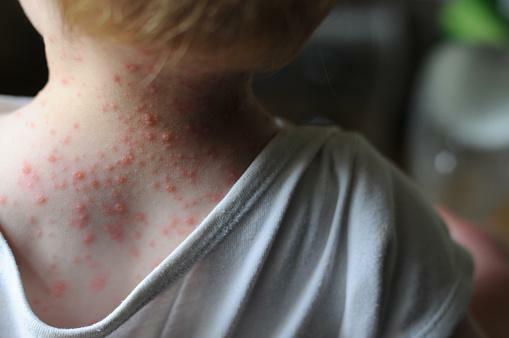 Chickenpox is highly contagious so your little one should be kept at home until all their blisters have crusted over. 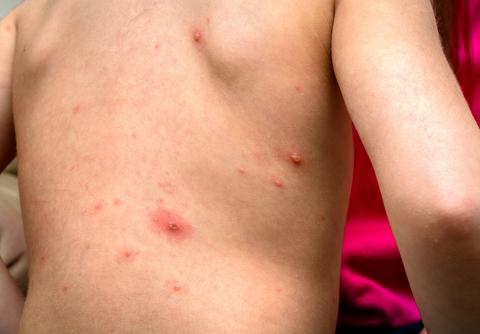 Most times, chickenpox only requires supportive therapy to keep your child comfortable. Using acetaminophen (Tylenol) to help control fever. Avoid using aspirin because of the possible association with Reye Syndrome (swelling of the liver and brain). If your child has an immune system disorder, speak with your health care provider. They may provide a special type of immunoglobulin (for example, varicella-zoster immune globulin), which has a large number of antibodies to help prevent infection, or your child's clinician can help with early treatment by providing an antiviral drug. The best way to protect your baby from chickenpox is to keep him away from anyone with the disease. You can also help him by making sure that everyone in your house is vaccinated against the disease. Once your child reaches the age of one, he can receive his first dose of the chickenpox vaccine. Between the ages of 4 and 6 years old, your child may receive his second dose of the vaccine. 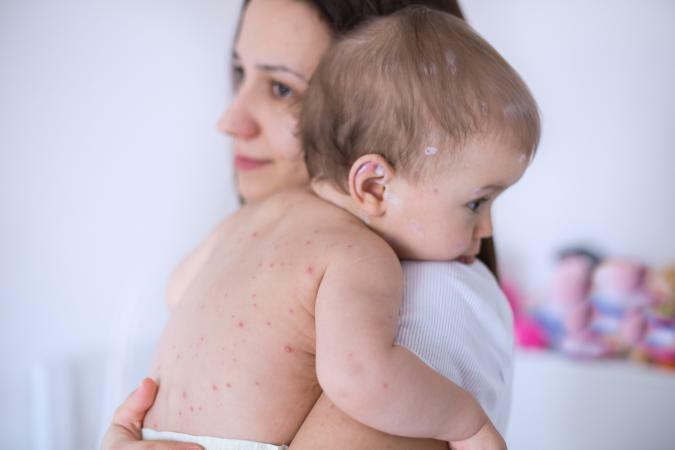 If you think your baby may have been exposed to chickenpox, call your pediatrician. She may recommend using a drug called acyclovir during the incubation period or if the rash starts to develop. 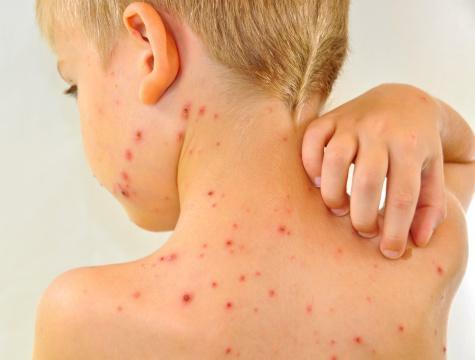 Chickenpox can make your child irritable and uncomfortable. By limiting their access to people with the active virus and ensuring they get their varicella (chickenpox) vaccine after the age of one, you can help your loved one remain active and virus free.